Flerovium - 114Fl Your user agent does not support the HTML5 Audio element. Flerovium atoms have 114 electrons and the shell structure is 2.8.18.32.32.18.4. The ground state electronic configuration of neutral flerovium is [Rn].5f14.6d10.7s2.7p2 (a guess based upon that of lead) and the term symbol of flerovium is 3P0 (a guess based upon guessed electronic structure). Flerovium: description Your user agent does not support the HTML5 Audio element. 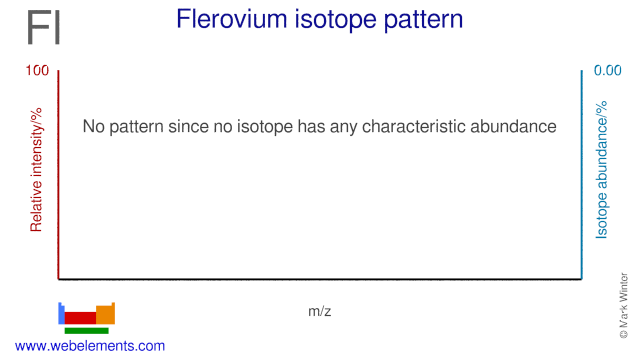 Flerovium was reported informally in January 1999 following experiments towards the end of December 1998 involving scientists at Dubna (Joint Institute for Nuclear Research) in Russia apparently using isotopes supplied by scientists at the Lawrence Livermore National Laboratory, USA. Only one atom was identified at that time and the claim only just been ratified. The results of calculations suggest that flerovium will not form a tetrafluoride FlF4, but could be isolated as a water-soluble difluoride FlF2. 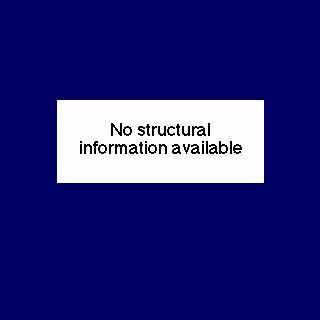 The solid state structure of flerovium is: bcc (body-centred cubic). As only a very few atoms of flerovium have ever been made, it has no biological role. Reactions of flerovium as the element with air, water, halogens, acids, and bases where known. Binary compounds with halogens (known as halides), oxygen (known as oxides), hydrogen (known as hydrides), and other compounds of flerovium where known. Bond strengths; lattice energies of flerovium halides, hydrides, oxides (where known); and reduction potentials where known. Flerovium was discovered by Workers at the Nuclear Institute at Dubna, Russia in 1998 at Dubna, Russia. Origin of name: flerovium (atomic symbol Fl) was named for the Flerov Laboratory of Nuclear Reactions where element 114 was synthesized. Georgiy N. Flerov (1913-1990) was an eminent physicist who discovered the spontaneous fission of uranium. He was the founder of the Joint Institute for Nuclear Research.. Isotope abundances of flerovium with the most intense signal set to 100%. Isolation: as only about three atoms of flerovium has ever been made (through nuclear reaction involving fusing a calcium atom with a plutonium atom) isolation of an observable quantity has never been achieved, and may well never be. The element decomposes through the emission of an α-particle to form element 112, copernicium, with a half life of about 30 seconds for 289114Fl and 2 seconds for 288114Fl. A different isotope of element 114, 285114Fl, is observed as a decomposition product of the recently observed element 118. Elements 118 and 116 were identified by accelerating a beam of krypton-86 (8636Kr) ions to an energy of 449 million electron volts and directing the beam onto targets of lead-208 (20882Pb). After 11 days work, just three atoms of the new element were identified. The production rates for element 118 are approximately one in every 1012 interactions. Element 118 nucleus decays less than a millisecond after its formation by emitting an α-particle. This results in an isotope of flerovium (mass number 289, containing 116 protons and 173 neutrons). This isotope of element 116, is also radioactive and undergoes further α-decay processes to an isotope of flerovium, element 114, and so on down to at least element 106.